A runner commented that using the Brooks Adrenaline GTS 17 for a half-marathon didn’t cause any blistering or pain. A tester stated that, for a shoe that has a bulky look, it was surprisingly lightweight. Several consumers reported that it was great for both running and walking. Many testers considered this shoe to be a very comfortable running companion. A lot of runners appreciated the stability mechanism that’s present in this model, stating that it prevented them from discomfort and injury. The visual style of this model worked well, according to those who have purchased it. The cushioning system received some recognition for being responsive, supportive and long-lasting. The forefoot section was roomy enough to let the toes spread naturally, several consumers wrote. Some reviewers noted that the Brooks Adrenaline GTS 17 didn’t feel tight because the width of this version allowed a bit of wiggle room. There were several consumers who warned that it was half-a-size smaller than what they were used to. A number of testers reported that the mid-sole platform was too stiff and unwieldy; it apparently caused them some underfoot discomfort. Some runners commented that its toe box was narrow, and that it caused some discomfort to the forefoot section. A few testers felt that it was the insole that actually made the interior environment feel tight. The Brooks Adrenaline GTS 17 was agreeable enough, according to many testers. The supportive and stable mid-sole worked well for a lot of them. There were those who also welcomed its cool design and its secure construction. Conversely, a number of runners weren’t able to acclimate well to it; there were concerns about its sizing scheme, its width, and the responsiveness of its platform. But overall, many were able to enjoy this road stability running shoe. This is a contest between two of the most established and best-known stability road shoes from two of the finest companies. This contest will be a minimum of 50 Miles for each pair of shoes on roads of the U.S. States of Indiana, Kentucky, and Illinois. The winner of this event will receive an all-expense paid trip to the U.S. Air Force Marathon at Wright Patterson Air Force Base in the U.S. State of Ohio, in September! The reliable Brooks has been improving a little every year for 17 years. The Adrenaline has some of the very latest technologies available and a dedicated group of loyal followers. Brooks has made flexibility one of their priorities, the Ghost, Launch, Ravenna, and Adrenaline are all quite flexible. With carbon rubber and deeply cut grooves called the Omega Flex Grooves, the GTS-17 is a fairly flexible stability shoe. Stiffness (lack of flexibility) in a shoe is something that must be overcome by some outside force such as the efforts of a runner's heart and legs. This outsole has proven to be very durable, and amazingly quiet on the run. Adhesion is excellent. The sole has a footprint that plants a lot of rubber on the ground, and this helps with traction while serving to share the load forces over a larger area. I feel stable and confident in these shoes due in part to the outsole design. The cushioning is a combination of BioMoGo foam and DNA material. BioMoGo is an excellent foam that is friendly to the Earth by not taking over 900 years to degrade once placed in a landfill and doesn't become toxic once degraded. There is a Progressive Diagonal Rollbar made up of multi-density BioMoGo that spans from the heel to the midfoot to keep you stable, like a guard rail on the highway, it is there if you need it for some guidance. DNA is a Brooks innovation that has largely changed the definition of a running shoe, in much the same way the Concorde has re-defined airliners. DNA is an adaptive material that changes properties depending on the runners' gait, effort, weight, and running style by becoming stiffer during a sprint or hill climbs and softer when simply easily jogging down the lane. The Brooks uppers are a basic spacer mesh with a pleasant and rugged appearance of quality and functionality that makes me wonder who needs engineered mesh? The upper forefoot is mostly stitched free. Reflectorization is excellent with full 360 degrees of after-dark coverage. Tongue and collar are well padded with no tongue slip on this model and no ankle rub at the collar even on uneven roadways. The Adrenaline is designed to be laced up, taken for a run and forgotten as soon as you leave the building. The Adrenaline GTS 17 does not at first seem amazing, running in the Adrenaline is a pleasant experience with few poor surprises. My first run in these shoes was another pre-dawn outing & immediately you notice that there is not a lot to get used to until you sprint, crest a hill or go high tempo, then the DNA kicks in. The Adrenaline runs smooth and almost as quiet as the Brooks Ghost or Launch. 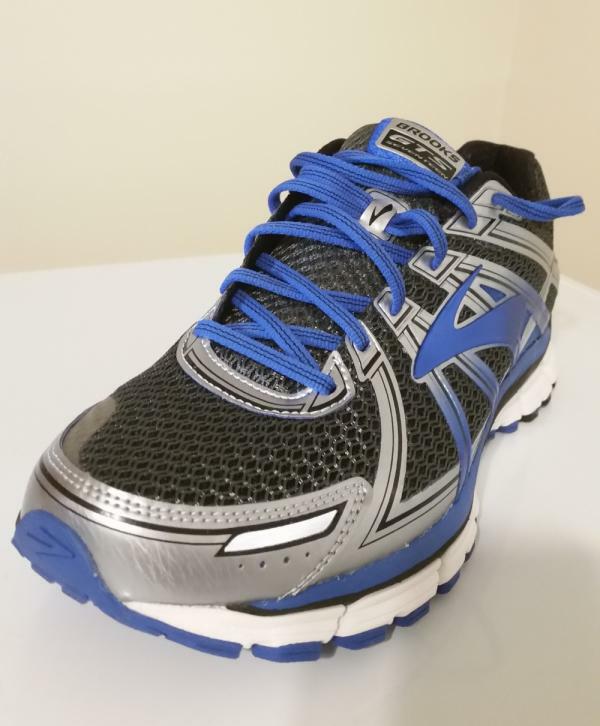 I recently ran a half marathon in training and noticed there was very little pain or soreness in the days after, due in large part to the flexibility of this shoe. I rarely do interval runs, but when I do, I step it up to something I would call a tempo or when digging deep to crest a hill, I can feel the DNA changing its personality. The Brooks Adrenaline is a good steady and predictable shoe with no surprises. This is a great any-distance shoe for any size runner. However, for me, the forefoot was a bit narrow. The Amazing Asics Kayano 24, with years of engineering progress, now brings us one of the finest good-olde running shoe ever made. The Kayano team has never lost sight or changed their minds about what the Kayano should be. With AHAR (Asics High Abrasive Rubber) in the heel for durability and a variation of AHAR in the forefoot blended for comfort. Traction on the wet roadway is good but not quite as good on the painted white lines. Cushioning on this shoe is revolutionary. FlyteFoam is an amazingly light and lively foam that Asics developed over three years in the labs of the Asics Sports Science Institute. There is also a generous portion of the silicone gel that Asics is well known for. These two types of cushioning are used in the right combination and work well together. Asics Gel is a little bit heavy while the FlyteFoam is said to be 55% lighter than regular EVA. The outcome of this combo seems to be that the Kayano hasn't changed much in weight, even with the newer foam. The upper on the Kayano is an engineered mesh that appears to be fairly thin and comfortably wraps the shape of my feet. There are no stitches in the forefoot to rub you the wrong way. There is a very welcome toebox that went missing two models ago. I bet Kayano sales went down when the old reasonable toe box went away. There is an attachment on the rear of the shoe called "exoskeletal," it works. My right heel would always slip a little more than the left, not so in the Kayano 24. My first run in the Kayano 24 was on another warm, pre-dawn, summer morning after night rain. My ideal running conditions, I enjoy running alone, with no cars and the darkness make it seem like your moving faster. I work the overnight shift and best enjoy this time of day. Early morning runs also offer cleaner air. Traction is excellent on the wet roadways, with a bit less traction on the painted lines, as expected. The FlyteFoam adds a lot to the Kayano, taking less out of my efforts or by putting more back into my efforts, I am not sure which. I opened the box and found a shoe that was alarmingly stiff, I nearly put them back in the box and returned them, I went for a run instead. These shoes are ideal for the runner with a good and steady pace, not the long strides of a 17-minute 5K runner. These are half or full marathon shoes. With the high price tag comes high quality and loads of features and added weight. With these two superstars being so close in many areas including technological innovation, workmanship and the use of quality materials, the winner came down to how well they ran or how good the runner felt during the testing. The Asics are more lively and with more bounce, but the Brooks is less tiring on longer runs. I mentioned that the Kayano team never lost sight of what it was "supposed" to be, they might now consider thinking about what this shoe "could" be, it could be 50 grams lighter and at least bend in the middle! The winner and new champion after 17 years of development, and will be going to the U.S. Air Force Marathon in September is the mild-mannered friend from Seattle, the Brooks Adrenaline GTS 17! The running shoe industry might be looking nervously at the Brooks Adrenaline 17! The Adrenaline 17 felt light out of the box. The digital scale read 12.3 oz./349 g for size 12 US, 46 Europe. High-quality construction with no misplaced glue. The highest quality stitching in all areas, including the hidden areas usually out of sight under the sock liner/insert. White Arrows point to the reinforcement of the big toe area, well-placed reflectors giving 360-degree coverage, and to second lace keepers. The flat laces distribute stress over a greater surface area resulting in more comfort. Definitely all great ideas! 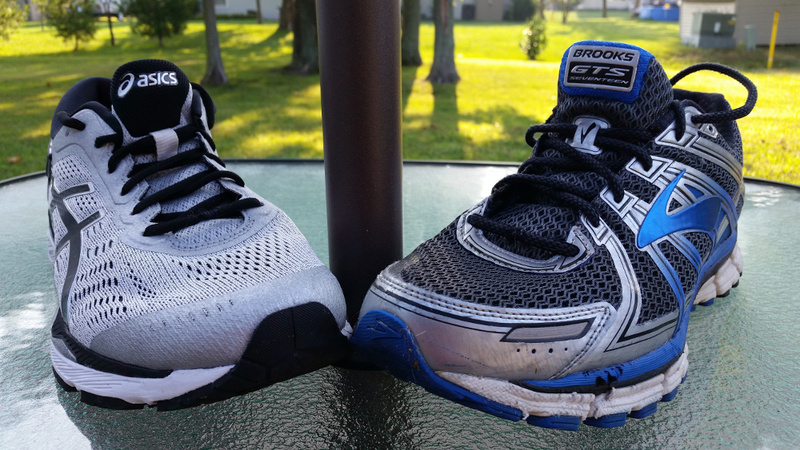 These shoes run very quietly and smooth, much like the Brooks Ghost, fast, smooth and quiet, no wasted energy. These shoes are a joy to run in and have a good grip on wet pavement. They seem to disappear under the runner which helps you get to more important issues such as breathing. The shoelaces have a good stretch. Heel to toe drop is 12mm. Its outer sole though may pick up small rocks from time to time. Brooks has cushioning they call DNA, and I am beginning to think that DNA is something that actually works. My observation although not scientific is simply that the shoes seem to have a bit more spring on toe-off and more importantly, the bottoms of my feet hurt a little less after a long weekend run with these shoes. It is difficult to compare DNA to Asics Gel while standing around, the Brooks DNA is dynamic and changes on the run. I did try to buy last year's version, but they had none in my size; however, I do not regret having paid full price for these shoes, they are an excellent value. I have had two previous versions of this shoe but have never enjoyed them as much as these. They get better each year! The Brooks GTS 17 continues to evolve with annual changes that are well thought out improvements that come from engineers and scientists, and not simply marketing experts and rushing managers. The Adrenaline GTS (Go To Shoe) is best suited for the marathon/half marathon with no changes needed. The Brooks Adrenaline GTS 17 like the Brooks Transcend 6 is a running shoe that’s meant for runners who want more stability in their performance. It features many color schemes, which allow the purchaser to find more versatility in terms of the ocular presentation. Its components and features match its style, as well. The upper unit makes use of fabrics that are able to manage moisture. This feature ensures that sweat won’t permeate into the fabric and cause any odor or bacteria buildup. Synthetic overlays have been stitched on the façade of this shoe in order to provide a snug and secure coverage. The mid-sole unit of the Brooks Adrenaline GTS 17 makes use of the BioMoGo DNA foam technology, which is responsive and long-lasting. It molds itself into the shape of the wearer’s underfoot, making sure to support the areas that aren’t regularly cushioned. The PDRB or Progressive Diagonal Roll Bar is a stability mechanism which prevents over-pronated foot motion. The external section of the sole unit utilizes a rubber compound that’s highly resistant to abrasion. It covers the rest of the mid-sole and shields it from the potentially damaging nature of the surfaces. The forefoot section features a more responsive material called blown rubber. It delivers additional cushioning and lift, making each toe-off more enabled and energized. The Brooks Adrenaline GTS 17 has a standard running shoe length. It comes in sizes that adhere to the regular preferences of runners. There are a variety of width profiles: Narrow - B, Medium - D, Wide - 2E, Extra Wide - 4E for the men’s version. For the women’s version, it’s Narrow - 2A, Medium - B, Wide - D, Extra Wide - 2E. The HPR Plus is a rubber compound that’s highly resistant to abrasion. It is capable of protecting the rest of the sole unit from the abrasive nature of the surfaces. It also delivers long-lasting and efficient traction. Blown Rubber is a compound that’s more responsive than shoe-standard rubber. It gives additional cushioning to the runner. Placed in the forefoot section, its job is to add a bit more responsive cushioning as the wearer gears up for the toe-off. The Stable Pod Configuration is the design of the mid-sole/outsole. It makes sure that the platform is shaped in a balanced and ergonomic way, therefore affording the runner a smooth and agreeable heel-to-toe transition. The Omni Grooves are small trenches in the sole unit, which allow the runner more flexibility. They make sure that natural foot-movement isn’t impeded or restricted. The BioMoGo DNA is a high-quality foam material that’s actually made from the amalgamation of two distinct Brooks technologies. This midsole technology is also used in the latest Adrenaline shoe, the Adrenaline GTS 19. Derived from recycled materials, it caters to those who are more conscious of the environment. It’s also functional; it gives contoured support & cushioning to the underfoot. The Progressive Diagonal Roll Bar or PDRB is a tri-density foam unit that runs from the heel to the forefoot area. It stabilizes the foot by supporting the arch and correcting its positioning. It’s a means to prevent discomfort or injury due to unusual foot-pronation. The DRB Accel is a unit that’s made from thermoplastic polyurethane. Placed in the middle area of the platform, it supports the underside of the foot and provides torsional rigidity, which basically reduces muscle strain and fatigue during the running session. A segmented crash pad has been applied to the Brooks Adrenaline GTS 17. Called the Caterpillar Crash Pad, the sole unit follows the segmented form and motion of a caterpillar. With this design, the platform is able to localize impact shock protection, cushioning and stability to the area of the foot that currently needs it. The Omega Flex Grooves are furrows in the mid-sole. They assist in making the platform more flexible and agreeable to the natural movement of the foot. Additional contoured support is given by the Profile Sock Liner, an add-on that’s made from BioMoGo foam. The Element Mesh is a breathable fabric. It allows air to enter the foot-chamber in order to keep the foot cool and dry. It also manages moisture, preventing it from being absorbed by the interior fabric and padding. The mid-foot section of the upper features an Adjustable Saddle. It ensures a more comfortable and secure fit, while also preventing any wobbling of the foot. Synthetic Overlays have been stitched onto the main upper fabric. They make the overall coverage more secure because they adapt to the tightening or loosening of the shoelaces. The Element Lining is the material used for the interior sleeve of the Brooks Adrenaline GTS 17. Like the Element Mesh, it also prevents moisture from being absorbed by the shoe, thus keeping the interior environment suitably dry and odor-free.